Parts of Arctic Siberia are releasing ten times more carbon into the atmosphere than previously thought, a University of Manchester scientist and an international team of researchers have found. Writing in Nature, the scientists, led by Stockholm University, discovered that much more greenhouse gas is being released into the atmosphere than previously calculated, from and ancient an large carbon pool held in a permafrost along the 7,000 km desolate coast of northernmost Siberian Arctic – dramatically increasing global warming. As the temperature climbs carbon, stored in vast ice walls along this Arctic coast called Yedoma, covering about one million km2 (four times the area of the UK), is pouring into the Arctic Ocean in one of the world’s most remote and desolate regions. This region is experiencing twice the global average of climate warming. While satellite images reveal thousands of kilometers of milky-cloudy waters along the Arctic coast, suggesting a massive influx of material, the Yedoma has remained understudied largely due to the region’s inaccessibility. By studying the thaw-eroding slopes of a disappearing island, the team found that the tens-of-thousands year old coastal Yedoma carbon is rapidly converted to CO2 and methane, even before being washed into the sea. Additional analyses of marine bottom sediments revealed that erosional input from ancient coastal Yedoma was the dominant source of carbon, much larger than inputs from marine sources and river-carried debris from soils. 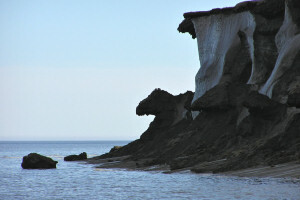 While the present rate of carbon release from the NE Siberian coast is not substantially affecting the CO2 levels in the global atmosphere yet, the study, jointly lead-authored by Stockholm University PhD student Jorien Vonk (now at ETH-Zürich, Switzerland) and post-doc fellow Laura Sanchez (now at the Catalan Institute of Climate Sciences), demonstrates that the process is firmly underway. Dr Bart van Dongen, from The University of Manchester’s School of Earth, Atmospheric and Environmental Sciences, worked with teams from Sweden, Russia, USA, Switzerland, Norway, Spain and Denmark to research the region. He participated in a seven-week sea expedition to this remote region during which a large part of the samples used in this study were collected. He said: “This research sheds light on a globally understudied area of the world, but one which has huge consequences for the entire planet. “Although this is a very remote region thousands of miles from the UK, considering the amount of carbon locked in this permafrost is twice the amount present in the atmosphere as CO2, the scale of the release of both CO2 and methane into the atmosphere will have a huge effect. This study adds to previous reports on extensive methane releases from collapsing subsea permafrost on the East Siberian Arctic Shelf (ESAS) published by the team. Professor Örjan Gustafsson, from Stockholm University and co-leader of the team said: “In order to project the future trajectory of greenhouse gases in the atmosphere, it is important to study the interaction of a warming climate and releases from the enormous carbon pools held in coastal and subsea permafrost, as well as in methane hydrates, on the ESAS”. The paper, Activation of old carbon by erosion of coastal and subsea permafrost in Arctic Siberia, by J. E. Vonk, L. Sanchez-Garci, B. E. van Dongen, V. Alling, D. Kosmach, A. Charkin, I. P. Semiletov, O. V. Dudarev, N. Shakhova, P. Roos, T. I. Eglinton, A. Andersson and O. Gustafsson, is available on request from the Press Office. Dr van Dongen is available for interview on request.